This blog is a place where I can share my conservative views with the people of Saugerties, NY. Mark Knaust and Bill Trumpbour discuss land use in Saugerties. Land use is one of the most important and vexing issues facing Saugerties today. Important because we are in the midst of a profound period of change in our land use patterns and vexing because the subject covers a broad range of issues that offers no easy solutions. How we use our land, and the the impacts that flow from that use, will go a long way in determining not only how this community views itself but also our overall quality of life. Saugerties has always been a predominately rural community. The importance of agriculture to this town was recognized when it was included in the original town seal in the 1830's, along with commerce and industry. Our relationship with the land has helped to define the town character and indeed the American character. In fact, the fundamental liberties that form the bedrock of this republic emanate from the recognition of private property rights. For most of the history of this country the land has been under the stewardship and protection of farmers. This relationship has left a positive and indelible mark on our character and is woven into the fabric of our society. Even today our school calendar still revolves around the needs of 19th-century farmers. The values that farming evokes - hard work, thrift, integrity and the giving of thanks every year for the blessings that providence bestows on us - form a very powerful component of our identity. It is with more than a little sadness and concern that I have witnessed the slow disappearance of our rural heritage in this town. 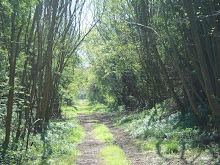 For too long we've taken for granted the beautiful countryside in this town, assuming it will always be there. I believe that we have to start realizing that behind every pastoral scene or bucolic setting there is property owner more than likely scrimping to pay their taxes. As long as government depends on generating most of it's revenue from land taxes there will be enormous pressure exerted on these landowners. The decisions that are made as a result of this pressure are likely to be bad ones. 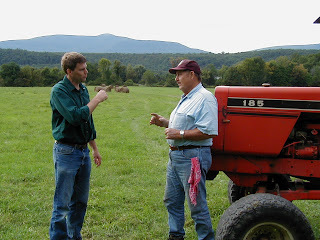 Recently, I had the pleasure of talking about these matters with a local Saugerties farmer, William Trumpbour. The Trumpbour family ties to the land go back to the original Palatine settlement in the early part of the 18th century. Bill started farming in 1947 and bought his wonderful wife, Ellie, an engagement ring with the profits from his first buckwheat crop. The farm and the land around it comprise some of the most beautiful scenery in the township. It has remained nearly unchanged since the days when, tradition has it, Revolutionary War troops celebrated in that field following their victory in the Battle of Saratoga. Not long ago the adjacent land was slated for development, something that thankfully has not happened. These rural scenes are a large part of what makes this town an enjoyable place to live. I don't want these thoughts to be misinterpreted as being against development of any kind. There are many people in the town that depend directly or indirectly on the building and construction trades. The town can grow but it should do so in a thoughtful and graceful way. A few years ago some of our local citizens worked very hard to produce a comprehensive plan for the Town of Saugerties that contains common sense and practical suggestions to accomplish just that. This town now needs leadership in pursuing that vision; a leadership that understands when a new business is sited in the town - one that could have a tremendous impact on traffic patterns say - it must go through proper regulatory review. It's time we start paying attention to these issues before we destroy the very aspects of this town that make it so appealing.